How important are your GCSE grades? - Which? GCSEs (General Certificate of Secondary Education) are subject-based academic qualifications. Students study towards GCSEs at secondary school in England and Wales over a period of two years, usually in Year 10 and 11. GCSEs are undergoing changes, which will continue to be rolled out until 2020. How will GCSEs affect my future studies? Entry requirements for school and college sixth forms vary – ranging from four to five C grades (that's between a 4 and 5 under the new GCSE grading system), with perhaps Bs in the subjects you want to study, through to at least six GCSEs at grade A for the most selective colleges. Your GCSE performance is usually a good indicator of how well you’ll do in A-level or other advanced studies – in fact, it’s the only real hard-and-fast evidence of your academic abilities a college has to go on. Many sixth forms use a scoring system, based on GCSE grades, to predict how well you’re likely to do (and from that, decide whether or not to accept you). For instance, five B grades (roughly 5 or 6) and five C grades (roughly 4 or 5) at GCSE could roughly translate to a predicted CCD at A-level, while straight A grades would suggest AAA is possible. The lower your GCSE grades, the lower you’ll be scored – which could limit the number of colleges and sixth forms open to you. If you're worried your grades might not cut it with the sixth form or college you want to go to, see if they're prepared to be flexible – otherwise, you may need to approach some alternatives, learn more about what to do if your grades don't go to plan. Appeal a GCSE grade - this how-to guide could come in handy if your results fall short of your predicted grades. As the changes to GCSEs roll out, there may be additional leeway as the changes settle in. Some sixth forms may say you can’t do a particular subject unless you’ve got at least a grade A (at least a 6 or 7) in that subject at GCSE. If your grades are mostly Cs (4 or 5), studying A-levels or Advanced Highers could be off limits altogether; a sixth form may offer you a vocational (ie a more practical and hands-on) course such as a BTEC Level 3 qualification instead. Regardless of the subject, you want to study, the majority of university courses look for at least a C grade in English, maths and perhaps science – that's grade 4 or 5 under the new structure. Management at the University of Leeds specifies that you must have at least a grade B (roughly a 5 or 6) in English language and maths under your belt. Law at Manchester Metropolitan University will accept applicants with GCSE grade C or 4 in English language or Level 2 Functional Skills English. Don't let a disappointing GCSE performance put you off applying to the university course you really want, though – a good AS-level performance, for instance, could outweigh a set of weaker GCSE results, particularly if you expand on this in your personal statement. But given recent A-level reforms, universities might use your GCSE grades more than before when deciding whether to accept you or not. Search for a course now to see full entry requirements and everything else you need to know. Because of the assumed connection between your GCSE and A-level results, it'll be down to you to prove you’re able to achieve top grades. Grades B and C (or a 4 to 6) at GCSE are suggestive of Cs and Ds at A-level – which won't be enough to get into some universities. The more competitive the university and course, the higher the number of high-achieving students with top GCSE marks applying. Some courses actively state this, like the University of Bath example above. Engineering courses such as chemical engineering: you'll usually need A-levels or equivalent in chemistry and maths, and physics for other engineering courses, which in turn means you’ll need to have good GCSE grades in science and maths. Social work and secondary school teaching: these professions won’t consider you without at least a grade C (or 4 or 5) in maths and English language at GCSE. Nursing and primary school teaching: grade C (or 4 or 5) in GCSE English, maths and science. And when it comes to employment right now – for that weekend job while you're doing your A-levels or a part-time job at uni – your academic grades will go on your CV, too. What do the new 9-1 grades mean? 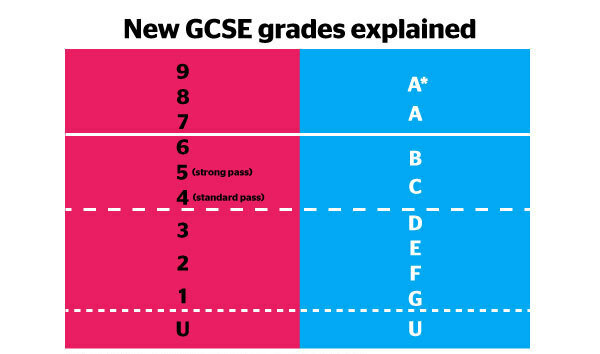 Since September 2017, the way GCSEs are graded has changed, moving from the alphabetical system of A*-G grades to the numerical 9-1 system. The changes are being slowly rolled out across subjects until 2020. 8 is between an A* and A. As you can see in the table above, old and new grades don't match up like-for-like. However, a 4 is being classified as a standard pass, which can be broadly compared to a grade C, while a 5 is a strong pass. Grades 9-7 are roughly equivalent to the old top grades of A* and A. If you're unclear what your grades mean or how they compare, speak to a teacher or check out guidance to GCSE entry requirements offered by individual universities. Sixth forms, colleges, and universities will be well aware of the changes to the curriculum and that your results will include a mixture of old and new-style grades. What you can do if your results don't go to plan? If you're concerned that one or more of your results might hold you back, don't panic – speak to teachers or a careers adviser about your options. English literature, language and maths GCSE resits take place in November. If you're willing to work hard it could be feasible to study for these (perhaps in the evening, perhaps through a different college) alongside the rest of your timetable. If you need to resit more subjects, you may need to wait until next summer. Bear in mind that for very competitive degree courses such as medicine, universities might not accept GCSE retakes; so if you have an idea of what you want to study at university, spend time researching the entry requirements of a range of courses to see what's open to you. If you're not happy with an exam result and you think it may be incorrect, it's important to first talk to your school or college. Students can’t make inquiries directly with their examining board, so it will be up to them to decide if you've got a strong case or not. Find out where the A-levels you're planning to take will lead you before it's too late with our A-level Explorer. Discover all the degree subjects you could take based on these, plus the careers which might follow. Perhaps you need to rethink those A-level choices following your GCSE results? Now's the perfect time to guarantee you're on the right path.